Fan artist BossLogic has taken the saddest scene in Infinity War and mashed it up with Disney's live-action remake of The Lion King. Disney recently surprised everybody and dropped the first trailer for Jon Favreau's take on the 1994 original, stunning fans who have been waiting months to see some official footage of Simba and the gang. However, there are still some Marvel fans who are still reeling from the events of the last Avengers movie, and now BossLogic has taken the two and put them together in a pretty epic way. The trailer for Disney's live-action remake is pretty much a direct homage to the original trailer from 1994, which ends as baby Simba is introduced to the world. It's a heartwarming image that BossLogic has now tainted with heartbreak. Instead of the iconic image of the baby lion cub lifted into the air, Thanos is seen dropping Gamora off of the cliff as Red Skull looks on. There's a lot more light in the new art then there was on Vormir, but it's still a pretty dark image. Marvel Cinematic Universe fans are waiting to see if Thanos' actions in Infinity War will end up sticking in the end. 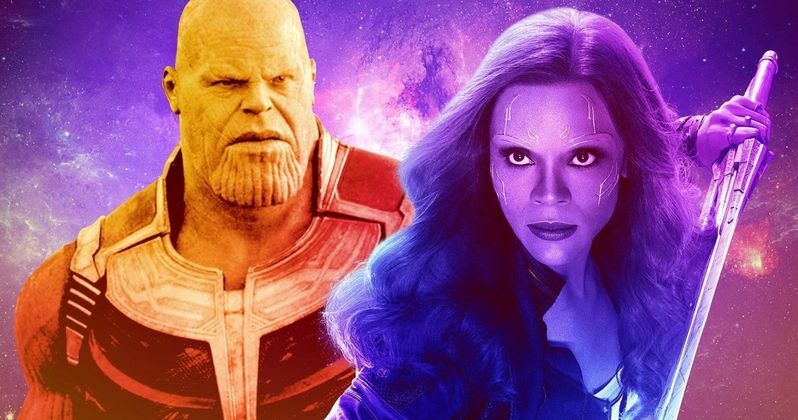 Many are hoping that Avengers 4 will see the reverse of the mighty snap as well as the death of Gamora. Obviously, the storyline is being kept under wraps for now, but that hasn't kept fans from trying to figure out what the Russo Brothers have planned for the future of the MCU and certain Avengers. Time travel will more than likely play a large role, but it isn't clear how everything will come together. BossLogic has been on a bit of a role lately, releasing his MCU and DCEU character mashups, which have generally been well-received by most fans. However, there were a lot of arguments that popped up on social media in regard to who would have been a better Batman or Aquaman or Wonder Woman. The artist is clearly doing all of this for fun, stoking new ideas that have turned into some fun arguments amongst fans of the DCEU and MCU. The new art taking a momentous event from The Lion King and turning it into something dark will more than likely incite a strong reaction as well. Disney's live-action remake of The Lion King won't be tainted by the sad events from Infinity War for long. The movie hits theaters this summer, 25 years after the original, and has plenty of its own heartbreak to share with the world. As for Avengers 4, that will open in theaters a few months beforehand, and it will hopefully give MCU fans some closure and answers leftover from the last movie. While we wait for both highly anticipated movies to hit theaters, you can check out the epic mashup artwork below, provided by BossLogic's Twitter account.